From 1896 to 1912 George Wilson Dudley from Virginia was granted numerous (at least 15) patents in USA, Canada and Great Britain mainly for adding and printing machines, but also for attachments for adding and tabulating for typewriters, and for a vehicle wheel. Most of the patents (beginning with the first patent of Dudley, US554993) were assigned to Numerograph Manufacturing Company of Charleston, and were manufactured by this company in small numbers at the end of 19th and beginning of 20th century. 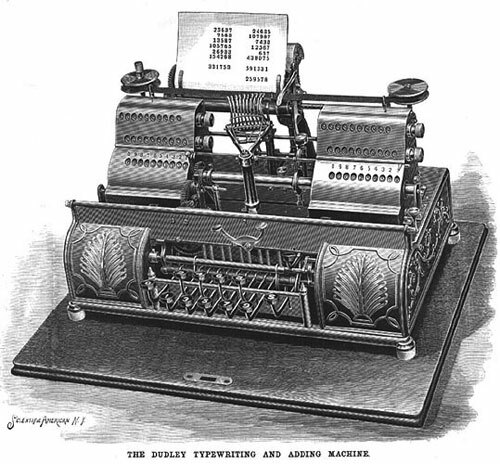 The first calculating machine of Dudley was presented in the 23 May, 1896, issue of Scientific American Magazine (see the illustration below). The Adding and Printing Machine of George Wilson Dudley. The illustration is from Scientific American Magazine and represents a double machine, upon one side of which can be kept the debts and on the other the credits, and a balance can be struck by deducting the one from the other. 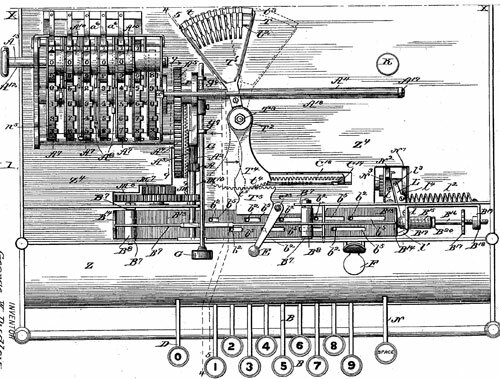 Let's examine in short the calculating machine of George Dudley, using the patent drawing (see the patent drawing below). The object of the device is to quickly and accurately add a column or columns of figures, and at the same time and by the same manipulation of the keys to print upon a sheet of paper these figures in the order in which they are added, so as to form a proof-sheet which shall verify the correctness of the addition. The machine by special adjustments may be made to print at the bottom of the column the sum total of the column, and to do this work in a vertically descending progression or vertically ascending progression or in a horizontal progression. The machine has eleven operating keys. The first one, D, on the left bears zero (0) and is not connected with the adding mechanism, but only with the printing mechanism. The middle keys, B, are nine in number and bear on their faces the numerals 1 to 9, and all have the action and connections, and all operate both upon the adding and printing devices when depressed. The key N on the extreme right is the spacing-key and has no connection with the adding wheels, but only cooperates with the paper-feeding mechanism and has its own peculiar connections. The machine verifies, by printing in full sight, each figure to be added at the same time the addition is made, and is so constructed that, if the proper key is struck, the result must be perfect. It works with the ease of a typewriter and its speed is only limited by the skill of the operator. It subtracts by reversing the machine as readily as it adds; in other words, the registering disks run one way as readily as the other. It carries automatically. The keys all work in the same horizontal plane and have for each figure the same dip or extent of depression. Its construction is simple, considering the variety and extent of work done, and its action in all its parts is positive. It is adapted to printing on pass books with the same facility as upon the ordinary platen and sheet. Additions can be made either to the right or to the left. It can be used to add without printing or to print without adding. Mistakes, if made, can be seen at once, and corrected as easily as mistakes upon the typewriter.